I recently went with my buddy to help him buy a new flat screen TV. He knew what he wanted – an HD LED TV with a screen size of 50” or better. Three TVs fit the bill that we both agreed were good deals. Though, the most expensive one had the biggest screen. Granted, it was only a few bucks difference in price. In the end, my buddy chose the biggest, most expensive TV out of the three. Why? Because to him, the few hundred dollars was a small price to pay for the additional value he will get out of his purchase. It was worth the cost. Part of this same process we go through when making purchases is to know when we are being swindled, forced to over pay, and NOT getting a good deal. Traders don’t have to overspend on computer hardware. In fact, I want to make absolutely sure that you don’t spend any unnecessary dollars on computer hardware that won’t even make a difference to your trading. 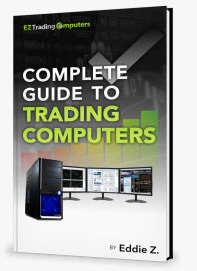 For that reason, I want to outline the areas of trading computers that you definitely want to spend your money. I often find myself evaluating my purchases for the most value. You might have done this before too. In fact, traders do this daily. What’s the last stock you bought? Odds are, in one way or another, this you asked yourself this question: Can buying this stock bring me more value than another similarly positioned stock? The more processing power the better. This is the #1 area to spend your money on. Processors have tons of value for traders. If you want to experience the data lag, slow applications, and general frustration you’ve experienced with low powered processors, then by all means buy an i3 or i5 processor. For the rest of you, invest in a powerful i7 processor and you won’t experience any of the issues I listed. What is RAM any way? Why is this so important? Here is the short and sweet answer: Ever have someone list off a bunch of things and ask you to remember them? You politely (or maybe not so politely) ask them to write it down so you don’t forget anything. This is short term memory – exactly what RAM does. Each time you use your computer you ask it to remember to keep doing a list of tasks. You might ask your computer to view emails, have an internet browser open with several tabs, run you trading platform, etc. Each of these tasks takes RAM (short term memory). When the memory is gone, it’s gone. Just like when we say, “I can’t remember all that,” to the person rattling off a list of needs. When your computer’s RAM is full, it just shuts down. This is an effort to reset its short term memory. So, if you list of needs for your trading computer is pretty long each day – meaning you have lots of applications and windows open, you need RAM. You should have at least 8GB, but 16GB or more is better. Remember, as a trader, you are a power user. You place significantly more demands on your computer than the average user. For instance, your trading platform most likely uses 2-4GB of alone. You can see how traders use RAM quickly and why it’s important to have enough RAM available. Imagine being able to be 2x more efficient than you currently are each day. All this at a one time cost of a couple hundred bucks. Would you find value in that? This is what multi monitors offers you. I personally think this huge advantage comes in at a reasonable, even cheap, price. There are lots of other features you could spend money on and get a lot less value out of it. This is a great place to spend some money. Dual monitors are great for those who have limited space. I recommend taking a look at a quad(four) monitor set up. Get yourself a nice stand so you have lots of easy adjustments you can make to the screen angle. It’s worth it.